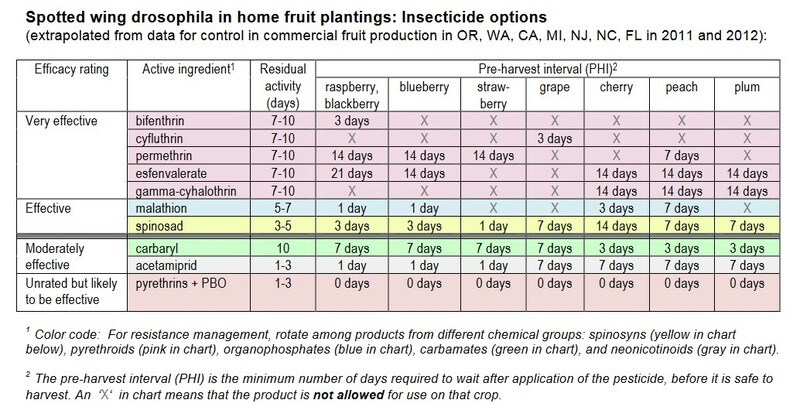 NOTE: Commercial Growers should see Managing Spotted Winged Drosophila in Commercial Fruit Production. The spotted wing drosophila (SWD), Drosophila suzukii, is found in most areas of Iowa and is a pest of home garden fruits, especially, raspberry, blackberry, blueberry, grape, aronia, strawberry and possibly tomato and apple. Unlike the common fruit fly SWD females use a unique serrated ovipositor to insert their eggs through the skin of fresh, ready-to-harvest fruit. They do not require damaged, cracked or rotting fruit to lay eggs. Eggs are laid in the flesh of soft skinned fruit just prior to harvest and as sugar begins to accumulate and fruits start to change color. Eggs hatch into tiny, white larvae that feed inside the fruit and cause the fruit to deteriorate. Larvae grow to 1/4-inch in length before dropping from the fruit to pupate and transform to the adult stage. SWD can develop from egg to adult in as little as 10 days or as long as a month in cooler weather. SWD adults live for about two weeks and each female can lay more than 300 eggs. Successive generations of flies may continue to attack fruits through harvest. Egg-laying punctures in the skin and larvae inside cause infested fruits to decay rapidly. Infestations may not be apparent at the time of harvest but brown sunken areas and collapsing flesh will become apparent in a matter of hours or days. Although not harmful or poisonous to consumers, the presence of the larvae in the fruit is unappealing and infested fruits so not store well. SWD looks very similar to our usual fruit fly (sometimes called vinegar fly). Adults are 1/8 inch long, yellowish brown with dark bands on the abdomen and red eyes. SWD is named for the dark spot in the outer edge of the male's wing. Females do not have wing spots but they can be recognized by the serrated appendage on the ovipositor. SWD spends the winter in tree rows and wooded areas. They are present through early summer but don’t appear in noticeable quantities until mid-July or later. They remain active until frost. Use good sanitation to prevent spread and further establishment of SWD. Harvest frequently and cleanly. Pick all fruit as soon as they are nearly ripe and remove and destroy any fallen, damaged and overripe fruit. Refrigerate fruit as soon after harvest as possible. Chilling will slow and may even stop the development of larvae. Infested fruit are safe to eat. There is no known risk to human health posed by ingesting SWD. You may be able to exclude SWD by covering a small planting with netting or a row cover. Netting must be very fine (openings less than 1 mm) to exclude SWD flies and must be in place before the first flies arrive. The netting must be completely sealed. Opening the row cover to pick the fruit may allow flies to enter and infest the fruit. Monitoring will determine if SWD is in your area and when your fruit crop is at risk. Place monitoring traps when the susceptible crop first starts to turn color. Check, maintain and replenish the traps through harvest. Traps can be constructed from a clear plastic cup with lid. Poke 5 or 6 holes through the sides of the cup and then fill with 1 to 2 ounces of apple cider vinegar and a few drops of soap. A yellow sticky trap can be added to aid in capturing the flies. See this Ohio State University video for more details on how to make and use SWD traps. Hang the trap in a shaded portion of the crop canopy and clear vegetation from near the trap. Check the trap for SWD at least every other day and replace the apple cider vinegar weekly or immediately after a heavy rainfall. Do not dump the old apple cider vinegar in the garden as it will attract adult SWD and reduce the effectiveness of the trap. Capture of SWD flies will help determine when insecticide sprays are needed to protect the fruit. Insecticide sprays protect the fruit by controlling the adult flies before they lay eggs. Insecticides will not control larvae already inside the fruit. It will take more than one application to protect susceptible fruit through the harvest season. Read and carefully follow label directions, paying special attention to the pre-harvest interval (the number of days following treatment when harvest can resume). Only a few insecticides are available for home gardeners that are effective and have a short harvest interval. The following table is by Celeste Welty, Ohio State University Entomologist. The best insecticide choices for most home gardeners will be spinosad and malathion.